Lynch Creek Dahlias: Dahlia Weddings: Oh, Those Luscious Colors! Dahlia Weddings: Oh, Those Luscious Colors! Beautiful dahlias come in any color you might want for your wedding, whether traditional pastels or intense hues, tones within a single hue or brilliant contrasts. "Dahlias have as wide a range as any flower you can imagine," says designer Colleen Hunter of Lynch Creek Floral. They track the rainbow from greenish yellow through apricot, red and pink to lavender and purple, and range in intensity from pure white to a burgundy so deep as to appear almost black. In fact, it's the colors that floral designers love most. "It's not just the range; it's the depth and complexity of the color," Colleen says. Many dahlias are bicolored, tipped or striped with a contrasting color as soft as cream and lavender or as distinct as red and white; others are blushed with an analagous color like yellow and apricot, pink and lavender, red and orange, or even a range from yellow to purplish pink. Some have second colors on the reverse side of what appear to be petals on dahlias but are actually florets. Traditional pale dahlia colors include pure white, white or cream tipped with pink or lavender, palest lavenders, pinks and soft yellows, both creamy and lemony. A brighter palette ranges from pink to vivid red, yellow and orange. And dahlias come in varying shades, from blushed white and palest pinks, lavenders and yellows to rich bronze, orange, apricot and rose to deep, intense purple, burgundy and fire-engine red. The color variations in dahlias as wedding flowers lend depth to bouquets and arrangements. 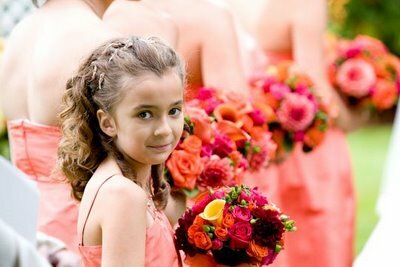 They also make it possible to create bouquets with colors that might be considered clashing, but which work to tremendous advantage, like the orange and pink dahlias Colleen combined for Courtney Gregoire's wedding (see left, in one of photographer Kim Bamburg's shots). The wide range of dahlia colors, varieties and forms means you're sure to find dahlias in hues the complement your chosen color scheme. At this point, someone's sure to whine, "But I want blue!" Okay, there aren't any blue dahlias—but there are plenty of dahlia hues that work with blue. And note: since blue has a short light wave in the color spectrum, it's a very recessive color. Delphiniums, Dutch iris and other blue flowers have a tendency to become invisible unless presented against a white background. What photographer doesn't love to capture images of beautiful weddings? 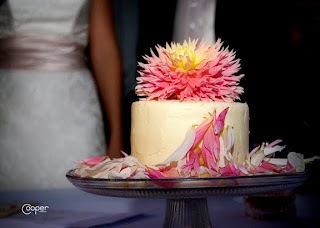 And dahlias, with their luscious colors, can make a lovely wedding even more beautiful. Dahlias Near the Arctic Circle? YES! Dahlia Pests: Some of 'Em Are Bigger!